Every autumn, the monarch butterflies east of the Rockies migrate from as far north as Canada to Mexico. Memory is not their guide — no one butterfly makes the round trip — but each year somehow find their way to the same fifty acres of forest on the high slopes of Mexico’s Neovolcanic Mountains, and then make the return trip in the spring. 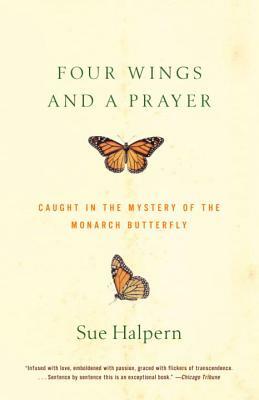 In Four Wings and a Prayer, Sue Halpern sets off on an adventure to delve into the secrets behind this extraordinary phenomenon. She visits scientists and butterfly lovers across the country, offering a keenly observed portrait of the monarchs’ migration and of the people for whom they have become a glorious obsession. Combining science, memoir, and travel writing, Four Wings and a Prayer is an absorbing travelogue and a fascinating meditation on a profound mystery of the natural world. Sue Halpern is the author of Migrations to Solitude. Her work has apeared in Granta, The New York Review of Books, The New York Times, Audubon, Mother Jones, Rolling Stone, and Orion, among other publications. She lives with her husband and daughter in a small town in the Adirondack Mountains of New York.